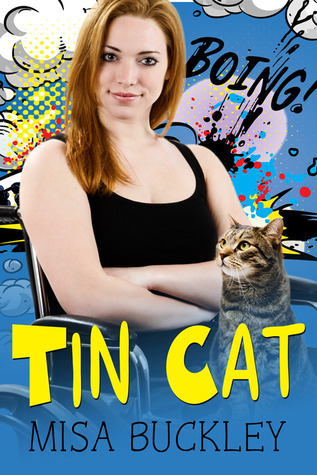 Tin Cat by Misa Buckley is a fun paranormal romance novella. I blazed through it and enjoyed every minute. The heroine, Amber, is snarky and brave. I loved that she was an unabashed geek with her own comic book shop to boot! The fact that she is in a wheel chair is a recent adjustment for her. She has learned to be independent and cope but she doesn’t think guys still see her… just the chair. Her boyfriend before the accident left her when he found out her new reality. I felt her pain. I loved when her girl friend Sharon reminded her not everyone was like “Jeff the Jerk”. Amber finds a stray cat out side her shop and rescues it. Not long after she adopts Cat a man comes into her shop. “Tall, lean, and leather-clad, he had a definite Blade vibe…” 😀 I laughed out loud when he told her his name’s Hunter Gray and she scoffs. I loved all the sci-fi references peppered throughout this story . Gray tells her he’s from the future and the cat is a dangerous. I really liked Gray. He’s protective, strong and yet he is as wounded as Amber. he has suffered loss as well and is trying to atone for his past. There are delicious sparks between them and I liked that her disability was not a hindrance to his interest. I loved the suspense element with the cybernetic cat and Gray trying to track down a time traveling bad guy. That kind of stuff sends my imagination soaring. Like I said, I couldn’t put this story down. I was caught up in the adventure and romance. I loved watching Amber and Gray explore their feelings. I was right there with her as she was trying to protect her heart from being hurt any further by a man from the future. I loved this novella! I embraced the element of seizing the day and not letting the past dictate your future… Also, the romance was hot. I recommend Tin Cat if you are in the mood for a sci-fi romance that’s full of snark and heart and courage. A year after the accident that put her in a wheelchair, Amber Gerald has more or less gotten used to living with her impairment. It doesn’t make a difference to running a comic book store anyway, and the customers have been the best support group she could have wished for.When she rescues an abandoned cat, Amber has no idea that she’s interfering in the mad scheme of a time travelling bank robber. Or that the man that walks into her store dressed like Blade is about to become her bodyguard.